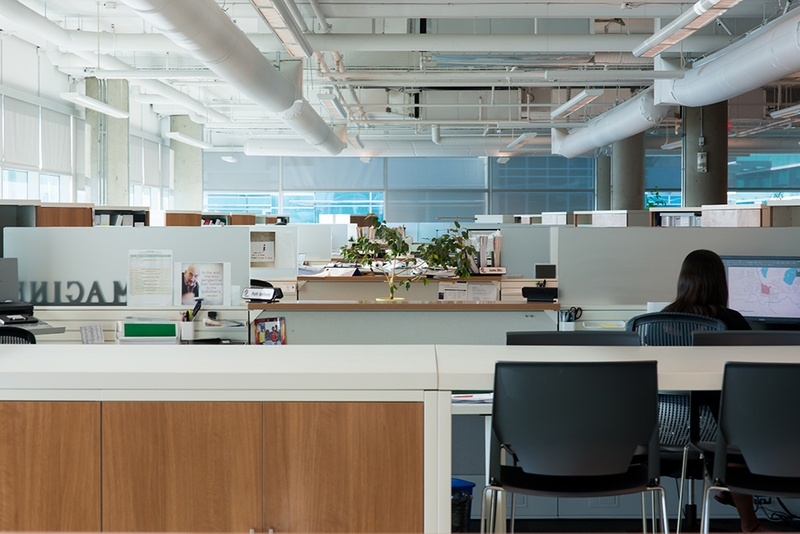 With the growing team at the Stantec Tyee location in Victoria came an opportunity to rethink the office organization and special needs. The existing space had once style of oversized desk, typical offices and a few boardrooms, which were always booked for meetings. The lack of variety meant meetings for a couple of people were being held in rooms that could accommodate large groups. The new design was focused around collaboration; break out spaces and lounge areas. ‘Pods’ of six workstations in a 120° boomerang style configuration were broken up with counter height workstations including stools and seating area as well as large banks of storage below. Smaller meeting tables, rolling white boards and high-back upholstered lounge chairs created options for staff to meet more casually when a boardroom was not required. The new desks included customized options for each user with personal storage towers (to hang coats or tuck purses away), sit-to-stand keyboard trays and monitor/laptop arms to allow smaller desk sizes while maximizing usable work surface. Small wood transaction tops in the center of the pods allow people to connect across sides without having to walk round, while frosted glass partition panels allow light to flow in while maintain privacy. The lobby and reception desk also received a makeover. New white leather lounge seating with Brent Comber fir tables create a welcoming area for clients to sit and watch images of recent project and local events on the new flat screen TV. A custom shattered wood wall panel creates an eye-catching backdrop to the pin-mounted glass signage behind reception – also made by Brent Comber. The reception desk was reworked to include to fir slat wood wrap on the face with waterfall Bianco Carrara marble counter top showcasing a drop down recessed planter section at the corner. Clusters of glass Bocci pendant fixtures highlight the reception desk while a new Modernica mobile fixture beyond create a warm glow over the new lounge seating area.